Our Waikiki group surfing lessons offer the best value for your money and a safe environment where you can learn to surf in one lesson. Don't worry about organizing your own group - we'll make a group of 3-5 student surfers ready to team up with a Big Wave Dave instructor. There is no minimum group size or level of expertise – many of students in our group classes are beginners catching their first wave. All levels are welcome from beginner to advanced. The minimum age for group lessons is nine years old. (We offer lessons to kids as young as 4; however, for safety reasons, we require private instructors for kids 4-8 years old). We use soft-top boards for all our surf lessons. If you are an experienced surfer, please let us know as we also have fiberglass and epoxy boards available. We have extensive experience with special needs surf students with a desire to learn the art of surfing. Please let us know at the time of your booking so we can have the proper instructors available to ensure your amazing surf adventure. Lessons are $99 per person per 1.5-hour lesson. All necessary equipment is provided. We bring surfboard, leash, instructor. You bring a swimsuit, sunblock, and a positive attitude. Lessons are available year-round, rain or shine We welcome corporate groups, school organizations, civic groups, etc. Please contact us for group discount rates. Surf photo and video packages available to capture your memories. What Will Happen During My Lesson? You can expect that your first lesson will start on the beach with your instructor. You will spend about 20 minutes learning proper water safety and etiquette, paddling technique, turning the surfboard, maneuvering over waves and positioning to stand up and ride your first wave. The rest of the time, about an hour to an hour and a half, is spent in the water learning to stand up and ride waves. Once you stand up on your board for your first time, you will understand why surfers are so stoked all the time. 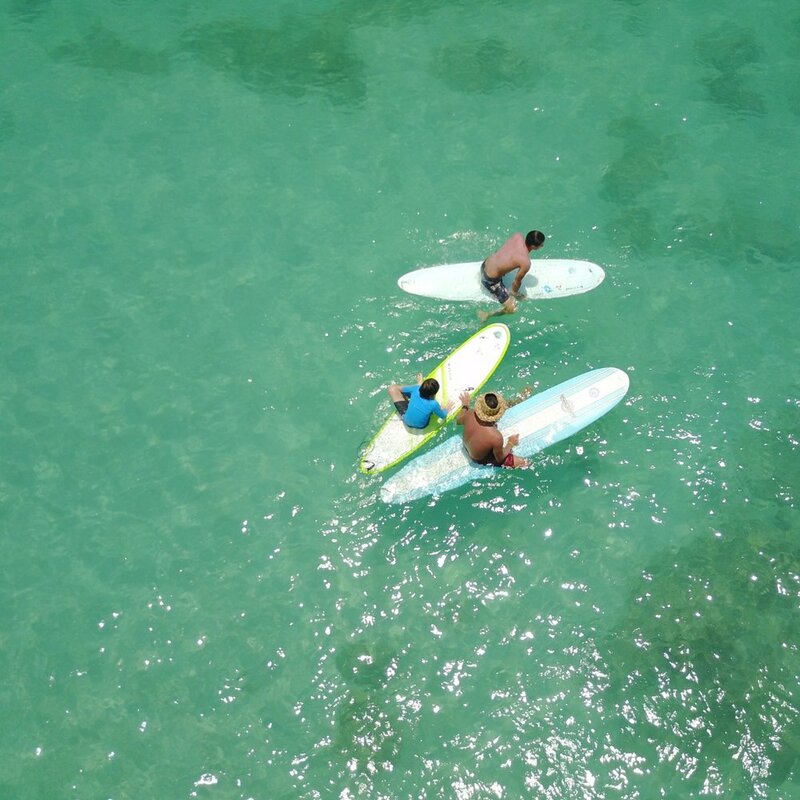 Interested in private or semi-private lessons in Waikiki or a private surfing tour of Oahu? Learn more about our customized options. check out our body boarding lessons!